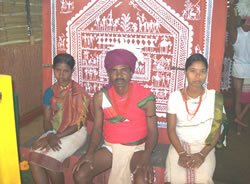 This group of tribe is one among 13-PVTGs existing in Orissa. They are called Lanjia Soura because of their traditional dress which they used to wear which appears like “Lanjia” or “Tail”.The traditional male dress consists of loin cloth approximately 6’-0” long and 10” width. It is tied around the waist passing between the thighs to cover the private part leaving one and half feet hanging in the back (as lanjia or tail). Similarly, the females of Lanjia Soura community us to cover the lower part of their body by handmade napkin leaving the upper partquite naked traditionally. They speak Soura Munda language. They have scattered housing pattern. The village guardian deities are represented by wooden posts installed at the entrance of the village. They pursue shifting cultivation and prepare terrace fields for rice cultivation. They have their typical labour cooperatives called ansir. The presence of lineage organization called Birinda. They famous for their attractive wall paintings, IDITAL. 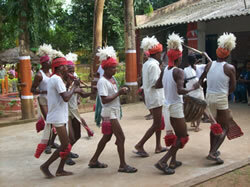 They observe Guar the Secondary burial ritual to commemorate the dead by sacrificing buffaloes.